The Dog Door Bakery is a New Hampshire company dedicated to making natural pet products. Our products are simple, natural and made from quality ingredients. 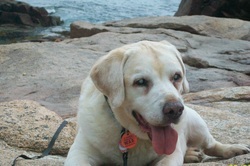 Our business began when we adopted older yellow lab, who had sensitive stomach and coat issues. Wanting to provide him with the very best for his health and wellness, we began developing our natural pet products. Our pet treats are delicious and provide your pet with the vitamins and minerals to grow and stay healthy....naturally. No artificial ingredients, no animal by-products, no fillers. We make all of our stocks from scratch - low sodium, slow simmered and rich. Just the way you make your homemade soups. The Essentials spray line of products are made from essential oils, light on the coat or skin and effective. They really work! Choose the very best of natural products that are safe and effective, there is no better way to say “I Love you” to that special friend. Zeke passed away in May 2012. His spirit is the catalyst for making healthy treats and natural, essential products for your pets, free of chemicals and unnatural ingredients. Fresh ingredients sourced from our own gardens.